To bring our afternoon to a close, Dan Flanagan, part-time revolutionary, brings his Tot Rockin' Beats to the Big Top. TRB offers all the best bits of a proper afternoon out whilst providing enough child friendly entertainment to exhaust even the most hyperactive of toddlers. 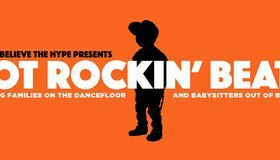 ‘It’s like going to an amazing festival except you don’t have to camp.’ If you’ve missed the old days of having a good boogie to the old classics since you had kids then Tot Rockin’ Beats is for you as you can have a drink and a dance whilst keeping the kids fully entertained. As Seen On ITV, BBC, Huffington Post, Fathers Quarterly Magazine.